OnLiveFans reports that OnLive will showcase several upcoming games at E3. From what they have learnt from their source, the games include Darksiders 2, Metro: Last Light, Sid Meier's Civilization V: Gods & Kings, South Park: The Stick of Truth, London 2012 and a couple of other SEGA games. Their source saw the OnLive E3 booth that is still under construction and they are not sure if OnLive will have a two-story presence like last year, but many game banners are already hung. As their source could tell there are no signs of a Sony presence at OnLive's E3 booth, so there's no fuel for additional rumors. Their source also saw Sony's booth and much of Sony's booth is under wraps, but from what is visible, there is no OnLive branding. 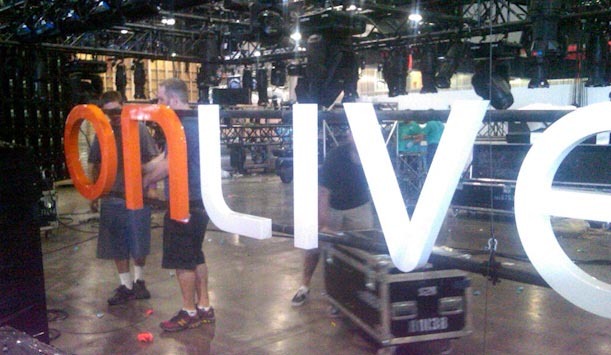 Below you can see a picture of the coming together OnLive booth.